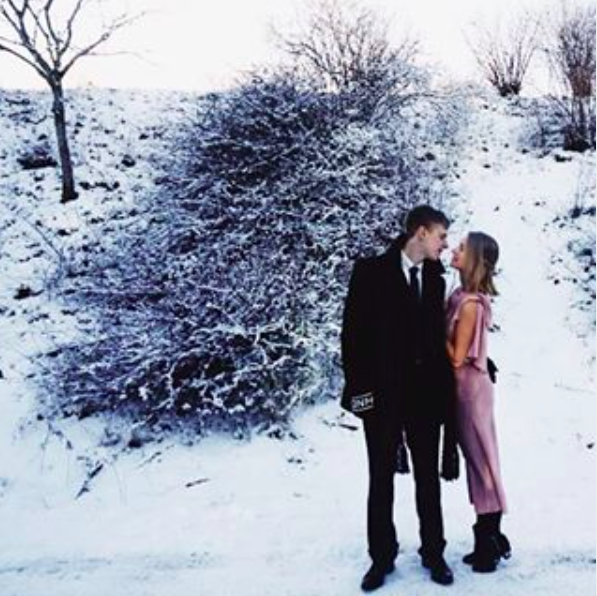 Alex thinks that it is too cold today in Uppsala. Kenny says that there is no word in Swedish for ‘too cold’. Put a coat on, Alex! As of today, there are 84 News apps on the iTunes store. The one I am enjoying most at the moment is the brand new Quartz app, available free. Quartz is remarkably easy to use. No complicated set up, no registration, no preferences. 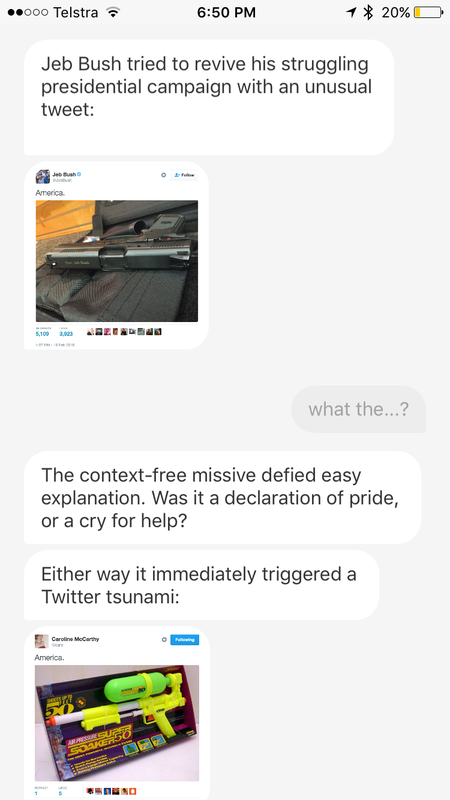 Fire it up, and you begin to receive chats from what feels like a very informed friend. Your only options are whether to learn more details about a particular story or to pass to the next one. 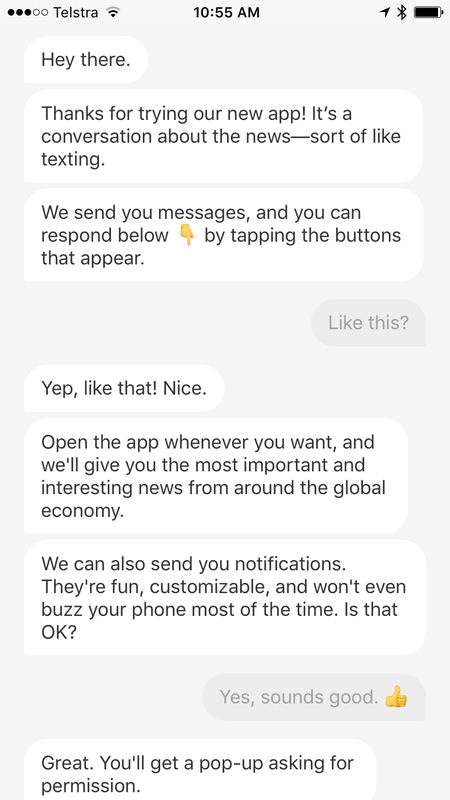 Open the app occasionally to see what’s new – just a few stories are available every time, so it takes only a few minutes to become up to date. 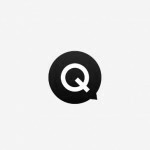 Although the app was released this week, Quartz has had a web presence sine 2012. Give Quartz a whirl and let me know what you think. Hop out of bed before sunrise at 6.30am tomorrow to see all five visible planets together in the morning sky. 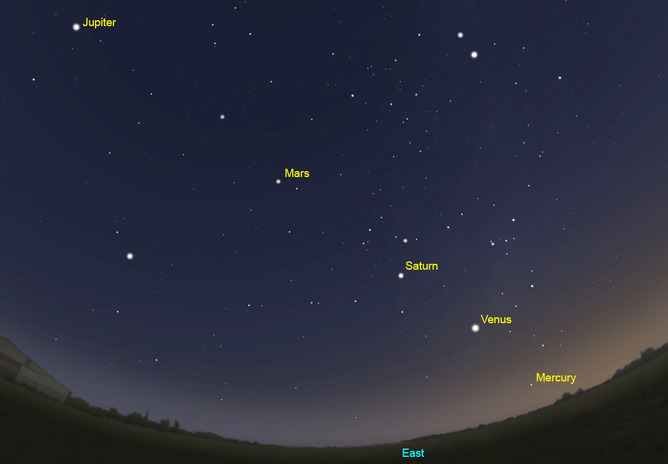 This ‘alignment of the planets‘ will be visible till the end of February. The five planets that are visible to the naked eye have been identified since most ancient times Wheres the stars are fixed in their constellations, the planets wander across the night sky. Indeed, the word ‘planet’ is derived from the Ancient Greek ἀστήρ πλανήτης astēr planētēs’ , or wandering star. 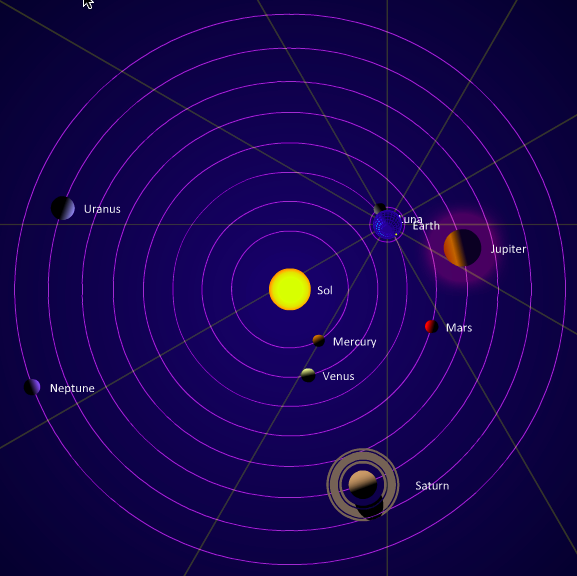 The picture above from The Planets Today shows the position of the planets in their orbits around the sun today. You can see us at 6.10am in Alstonweb as the bright little dot on the Earth. In this diagram, the earth rotates clockwise. 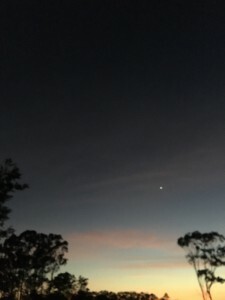 Mercury came into view over the horizon at 4.50am. If we look towards the horizon now, we will see Mercury, then Venus, then Saturn, then Mars and Jupiter will be overhead. At 6.30 the sun will be up over the horizon and the planets will be drowned out by its brightness. The planets align like this about every 12 years, although in the Southern Hemisphere we will get another chance to see the planets align in October this year, this time in the evening sky. The Star Walk App from the European Space Agency allows you to point your iPhone or iPad at the night sky and it shows you what you are looking at. 16th February 2013 Are You Smarter than a Chimpanzee? We were one of the last countries in the world to do so. Russia was first in 1704, France in 1795. USA’s initial currency after independence was decimal, their dollar first minted in 1792. Canada switched to dollars in 1854, despite objections from Britain, who wanted the Canadian ‘dollar’ to be known as the ‘Royal.’ New Zealand followed the year after us, but the UK persisted longer than we did, persisting with with Pounds, Shillings and Pence till 1971. The change to decimal based currency was driven by the complications of calculating in the pounds / shillings / pence system. Currency was written as £4-8-3d = 4 pounds 8 shillings and 3 pence. There were 20 shillings in one pound. There were 12 pence in a shilling. The penny was further sub-divided into two halfpennies or four farthings (quarter pennies). One penny was written as 1d. Three pence were known as thruppence, 6 pence as sixpence, and a shilling (12 pence) as a bob. 2 shillings were called a florin, and 5 shillings was equal to one Crown. A guinea was 1 pound and one shilling, or 21 shillings. 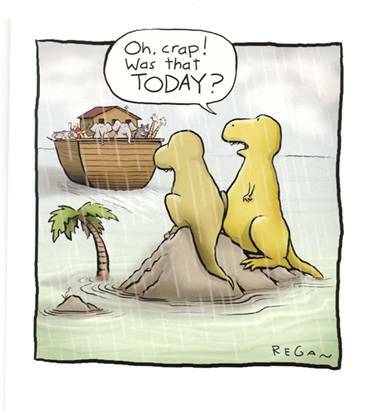 The decision to change to decimal in Australia was a long time coming. Soon after federation, in 1904, a Decimal Currency Select Committee recommended decimalisation, using a ‘sovereign’ consisting of 10 florins. But Britain was strongly opposed to any change, and the decision was delayed. Public opinion was ahead of offical decision making, particularly after soldiers were exposed to the benefits of decimal systems when travelling in both world wars. In 1958 the Decimal Currency Committee again recommend that decimal currency be introduced. The decision was finally made in 1963 and a date set for February 1966. The initial legislation called for a 10 Shilling/100 cent system. A public competition to name the major unit suggested Australian names such as the Austral, Emu, Koala, Digger, Oz, Boomer, Roo, Kanga, Kwid and Dinkum. In 1963 treasurer Harold Holt announced that the government had rejected all these suggestions. 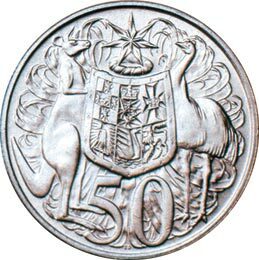 Our unit of currency would be known as ‘The Royal’, as encouraged by Britain and preferred by prime minister Robert Menzies. The other coins would be the crown (50c), the florin (20c) and shilling (10c). This didn’t go down too well – at all. The newspapers were filled with scorn for the suggestion, and opinion polls showed 95% disapproval of ‘the Royal’. Holt got the message and three months later announced that the major Australian unit of currency would be known as the Dollar, and the minor unit as the Cent. Pity – we should have gone with the Kwid. 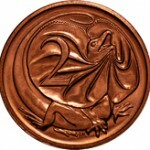 The coins were designed by Stuart Devlin – and I think he did a magnificent job. They still look modern 50 years later. They were the same size as the existing coins of corresponding value. 10c = 1 shilling, 5c= 1 sixpence. 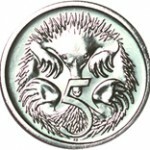 The 50c piece was round until 1969, when it was replaced with the 12 sided coin we now know. Polymer (plastic) banknotes were first introduced in 1988, using technology developed in Australia. 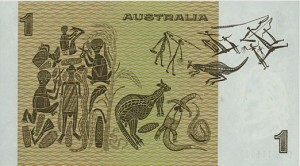 A complete set of plastic banknotes has been available since 1996. 7 other countries, including Canada and New Zealand, now also only use Polymer banknotes. $1 coins were introduced in 1994, and $2 coins in 1998. 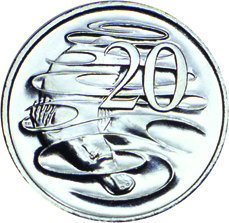 1c and 2c coins were removed from circulation in 1992. (thank goodness – it is very annoying in the USA getting 1c coins in change). You can bet your bottom Kwid that the 5c coin will soon follow the 1c and 2c out the door. ‘Dollar Bill’ lead the information campaign for the introduction of decimal currency. This video also demonstrates the intricacies of working with the old system. Scientists at the Laser Interferometer Gravitational-Wave Observatory (LIGO) announced this week that they had detected gravitational waves, whose existence was predicted by Albert Einstein 100 years ago. We instinctively ‘get’ gravity. We depend on it to walk, jump, throw and catch. Our muscles waste in its absence. Our phones break when it drags them to the floor. Much of our scientific understanding about gravity – what are its laws and how does it work – was discovered during some ‘enforced downtime’ during which Issac Newton and Albert Einstein each had the chance to have a good hard think. Cambridge University was closed in 1665 and 1666 due to the plague. Issac Newton, a recent graduate, was forced to spend these two years at home – thinking and writing. To assist him with his calculations, he invented a new system of mathematics – fluxions, or calculus – which he kept a secret. During this period he developed the ideas that sustained his academic output for the next 50 years. And he discovered the universal law that governed the clockwork-like motion of the planets and the moon (but also kept it secret). When he was able to return to university, at the age of 26, he was made chair of mathematics (a position currently held by Stephen Hawkins). Much later, in 1684, Christopher Wren, Robert Hooke and Edmond Halley came to Newton to settle a debate they were having about planetary motion. To their surprise, he was able to answer the question based on the calculations he had made twenty years earlier. At their encouragement, he eventually wrote down all his thoughts in Philosophiæ Naturalis Principe Mathematica, probably the most important scientific document ever written. The Principa, as it is known, was published in 1687. It contained Newtons Laws of Motion and Newton’s Law of Universal Gravitation. Newton was the first to realise that gravity didn’t just apply to planets and stars, but was a property of all objects. The earth ‘pulled’ down on the apple, but the apple also ‘pulled’ up on the earth. The Principa was a sensation from the moment it was published. Newton’s Laws could be tested against the observed behaviour of planets and of projectiles. His ‘laws’ matched the observations as accurately as could be measured. But how did gravity work? Newton himself stated “Hypotheses non bingo” (“I contrive no hypotheses”). He determined the laws that gravity followed, but did not think it his job to postulate on how it did its business. After graduating from the Zurich Polytechnic in 1900, young Albert Einstein was unable to secure a teaching position. So he took a job as a clerk in the Berne patent office, assessing the inventions that were submitted. It appears he did not find this work very taxing. He had plenty of time to conduct ‘thought experiments’ on the nature of light, space and time. His downtime at work caused a prodigious output of new ideas. 1905 is known as Einstein’s annus mirabilis (miracle year). In that year, at the age of 26, he published four groundbreaking papers – on the photoelectric effect, Brownian motion, special relativity, and the equivalence of mass and energy. These publications brought him to the notice of the academic world. Two hundred years after Newton’s Principa, Einstein’s Special Theory of Relativity turned our understanding of the physical world upside down. 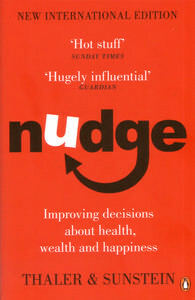 In the hundred years since then, everyone has ‘done their head in’ trying to understand the theory and its implications. In Newton’s world, time and space are absolute – it looks the same to every observer. The Newtonian laws of motion worked most of the time, but it became apparent that they fell down when an object travelled very fast, or became very massive. 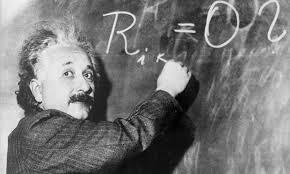 In Einstein’s world – what you see and what I see is relevant to each of us, and is dependent on our place and speed. Hence the Special Theory of Relativity. The speed of light is the same for observers, regardless of the motion of the light source. A consequence of this theory is that space and time and interwoven into ‘space-time’, and that mass and energy are equivalent – the famous E = mc2. Over the next ten years Einstein further developed his thinking and in 1915 published the General Theory of Relativity , which expanded on the Special Theory by incorporating gravity into the space and time continuum. Einstein answered the question that Newton had refused to consider. How does gravity work? Gravity is the bending of space-time by the mass of an object. Mass tells space-time how to curve, and space-time tells mass how to move. ‘Bending’ or ‘Warping of spacetime’ is hard to picture. An analogy of a trampoline is often used. Imagine rolling a ball across a flat trampoline. It runs in a straight line. But then sit on the trampoline and have someone roll the ball across it. Your weight will bend the mat (‘spacetime’) and the ball will follow a curved path. 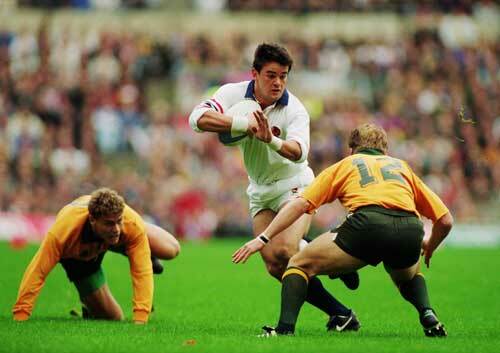 Swap places with me, as I am heavier than you, and the ball will curve more. Sit down quickly, and you will send a ripple of movement across the mat – a gravitational wave. The General Theory of Relativity theory postulates that gravity will bend light and will slow time (as seen in Interstellar). It predicts black holes and the existence of gravitational waves. Einstein worked all this out in his head, and did the maths to prove it with pen and paper. But is it true? Do these weird things really happen in the ‘real’ physical world. Scientists wasted no time in putting his theory to the test. In 1919, the Royal Society sent expeditions to Brazil and Africa to observe an eclipse and determine whether light from stars would bend inwards as it passed by the sun due to its gravity. It did. In 1959, it was shown that an atomic clock at the top of the Jefferson tower in Harvard ran faster than one in the basement, due to the difference in gravity between those two heights. And the following year it was shown that a clock placed in the centre of a large spinning plate ran slower than one moving more quickly on the rim. The GPS system is dependent on satellites circulating the earth at 20,000 km high at 14,000 km/hr. At that gravity and speed, the time on a GPS satellite clock advances faster than a clock on the ground by about 38 microseconds per day. If this were not included in the calculations made by our iPhones, Google Maps would position us way off course. The light from the stars has been a constant night time companion of mankind. Since 1600, the telescope has enabled us to see deeper into space. The development of the radio telescope in the 1930s opened up a new way of viewing the cosmos, using electromagnetic waves. Our horizon for both optical and radio astronomy was expanded by the Hubble Space Telescope in 1990. But until now black holes have been invisible to us, as they emit no radiation. But they do emit gravitational waves, as proven this week. 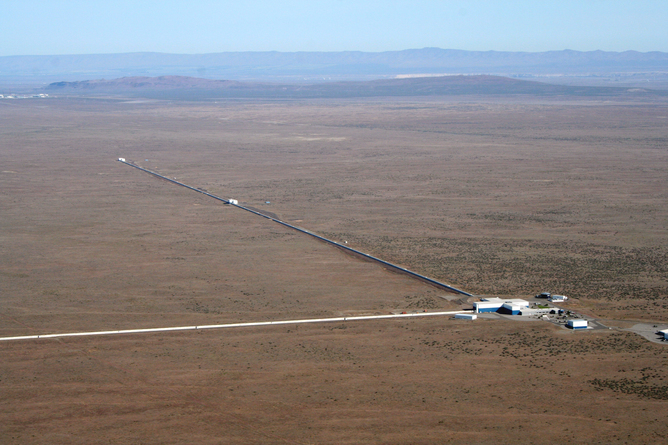 In 2016, gravitational waves offer a new way for us to view the universe. Physics has a rather large elephant in the room. There are two competing theories on which all modern physics concepts are built . They are General Relativity and Quantum Mechanics. We have been discussing Einstein’s General Theory of Relativity, which built on Newton’s laws, and which describes the behaviour of large objects (like planets, and cricket balls). General Relativity has been confirmed by every experiment that has put it to the test. 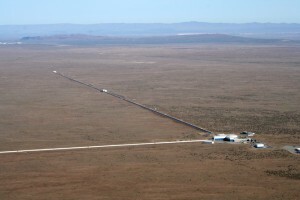 The new LIGO is the temple of General Relativity. Relativity is deterministic – you can predict where something will be based on where it is now and the forces acting upon it. The second theory, Quantum Mechanics, describes the behaviour of very small objects – atoms and smaller. According to quantum mechanics, we can only be a bit fuzzy about the locations of things. The best that you can say is each particle has a certain probability of being in any given location. And Quantum Mechanics has also been confirmed by every experiment that has put it to the test. The Large Hadron Collider near Geneva is the temple of quantum mechanics. Yet General Relativity and Quantum Mechanics are mutually exclusive. They can’t both be right. The Holy Grail of Physics is to find a ‘Theory of Everything’ that reconciles the two competing frameworks. 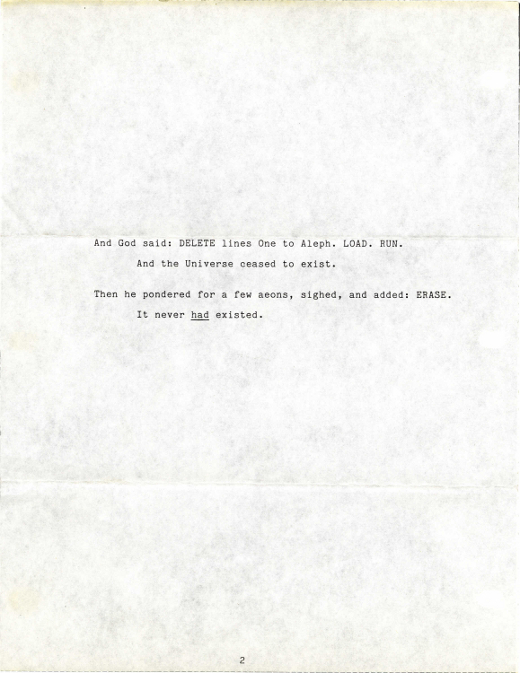 Einstein himself, though instrumental in the development of Quantum Mechanics, was not very keen on it as the basis for an explanation of all things. “God does not play dice with the universe”, he said. He spent his post 1915 career pursing a unified theory, that would extend his theory of General Relativity to incorporate the findings of quantum mechanics. He was unsuccessful. Stephen Hawkins has been on the same quest, but coming at it from the Quantum Mechanics side. “God does play dice with the universe. All the evidence points to him being an inveterate gambler, who throws the dice on every possible occasion”. The quest for the theory of everything remains unanswered. Everyone thought Newton was right. It took 200 years before Einstein showed he wasn’t. Perhaps what we need is for someone, somewhere, to have a prolonged enforced downtime, like Newton and Einstein, during which they can then have a good hard think about the Theory of Everything. Who will be the next Einstein? Activate Find My iPhone now!